Dookie grower Tony Ludeman was able to end the year on a high in spite of disease and climatic threats, by employing several tactics to stave them off including the use of fungicides, triazine tolerant hybrid canola and moisture monitors. Sclerotinia, frost and blackleg were just some of the threats facing landholders in northern Victoria in winter. The Dookie grower, who farms with his brothers Steven and Chris at Glenorim, planted 800ha of canola and 1000ha of wheat dryland on April 15, only to run into disease and problematic climatic events a few months later. Mr Ludeman recalls it was a particularly tough season in the area, with widespread outbreaks of sclerotinia due to very damp conditions at flowering, minimal in-crop rainfall and a severe frost, which impacted greatly on their wheat crops. However, pre-emptive action and careful crop selection helped their canola prosper. They used treatments of Prosaro at 450mL for a widespread fungicide application to deal with the damp conditions. The Ludemans also planted TT hybrid canola variety Hyola 559TT (30ha), Open Pollinated varieties ATR Gem (390ha), Thumper TT (270ha) and Crusher TT (120ha), and wheat varieties Gregory, Cobra, Mace and Magenta. At harvest in mid-November, they compared the Prosaro blocks (treated) against the control blocks (untreated). Blocks where fungicide was applied yielded 3.04t/ha in the Hyola 559TT and 2.76t/ha in ATR Gem, and oils were as high as 47 percent. 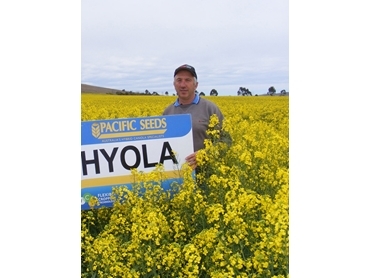 Where no sprays were used, the Hyola 559TT yielded 1.74t/ha and the ATR Gem produced 2.3t/ha. On average across the canola, the unaffected areas yielded 2.2t/ha and the affected areas 1.7t/ha. According to Mr Ludeman, using Prosaro increased their yield by 1 tonne in the 559TT and 0.5 tonne in the Gem. The really good oils in both of around 46-47 percent were an added bonus from the nice cool finish. He adds that the extra 300kg/ha justifies hybrid TT seed prices and appears to be worth the investment. The canola was sown using a 12.3m air seeder on 330mm rows and was harvested with a John Deere 8970 header. Also, 80kg/ha of MAP was applied down the tube with the seed and urea varied from 190kg/ha to 210kg/ha and was broadcast with 2-3 applications during year. Mr Ludeman said while the canola made the best of a bad season, he did not enjoy harvesting his wheat at the end of November as it was severely impacted by frost. One tool that may help with making long-term seasonal decisions in order to avoid climatic-driven catastrophes is a solar-powered soil moisture probe. After campaigning for three years, Dookie Land Management Group secured funding to install eight probes in Dookie and surrounding areas after harvest. Mr Ludeman says eight districts will get this technology after harvest. Many of the instruments will have the capability to measure rainfall, humidity, temperature and soil moisture, which is then uploaded online every hour. He explains that the probes will allow them to see how much rain and moisture there was throughout a season and how this impacted on yield, while also preventing excessive application of nitrogen, saving the growers time and money. Mr Ludeman said the final management decision he could make to minimise disease impact season-to-season was to alternate between varieties. Explaining it was simply about switching the varieties around and keeping the blackleg under control, he said he wanted to try 559TT for the first time up against Gem, as it had a different blackleg rating. When his agronomist suggested using 559TT this season, he decided to give it a shot as he had heard it was a stronger performer than the superseded 555TT grown last season. His decision has definitely paid off.